Join the 12th year of the 30 in 30 Cycle Challenge for Les Bourgs Hospice. Visit www.ride30in30.com, call Ian Brown's Cycle Shop on 721581 or email 30in30@ianbrowns.co.uk. Complete the challenge for the most amazing feeling of satisfaction! You may ride alone or with others. You may ride as far as you like. You may ride a bit in the morning and the remainder at night. If for reasons beyond your control you need to miss a day then you can catch up as soon as time permits. If you need to go away then you may choose to ride your hour on a stationary bike within a hotel’s gymnasium and this is acceptable. Entry is limited and so will be filled by those that can commit to the fundraising ethos of previous 30/30 challenges. All riders get together twice only during the 30 Days. On Day One all riders that can make it enjoy a breakfast together and again on Day 30, the day of the Rocque to Rock, all riders that can assemble together at Ian Brown’s Cycle Shop for refreshments from 11.00 am and ride their final mile together to the Finish at White Rock. We also have a 'Final Word' a few weeks later to announce the amount raised and have some fun looking at photos and sharing stories from the challenge. Remember your only pledge is that you ride your bike for at least 60 minutes each day and raise as much as you can for Les Bourgs Hospice. 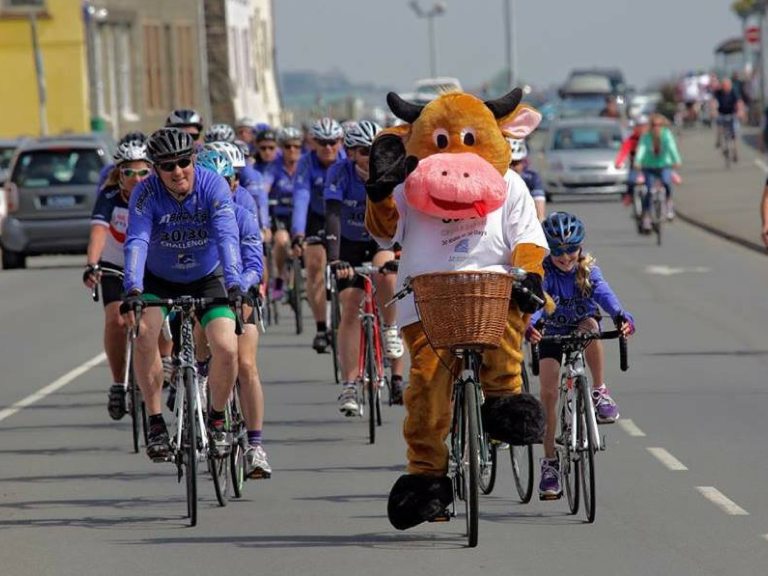 We do hope that many riders from past 30/30 Cycle Challenges will re-join so jerseys in the previous colours will be seen throughout the island during the 30 days. This is a growing event with many riders taking on the challenge each year, the team spirit is great and personally we love to see the ingenious ways the riders undertake this challenge and raise money to encourage more sponsors.